This month we’re going to be exploring the intersection between design and sustainability and ask: what is happening in the worlds of UX and design that can help? Fresh from finishing his book Designing For Sustainability, author and Mightbyte founder Tim Frick will outline why you might care about the impact of the digital products you use, and what you can do to use and design greener services. The lovely folks from @joincoup share their story prototyping a zero emission scooter service for Germany’s capital city, and the service design considerations of scaling a mobility start-up across a country. Big thanks to BCGDV for stumping up the drinks and food on the night! Can machine learning help us tread more lightly on the planet? This month, we’ll be asking a professor of machine learning is, what it is, why it’s important, and hearing from people building businesses around it, to create greener, smarter services. Next, we’ll be opening up the event to audience participation, with a fishbowl session, to give you a chance to explore the subject, from different angles and have your burning questions answered. Special thanks to the lovely, lovely people at the German Technology Entrepreneurship Center (GTEC), for providing the space, and helping make the event possible. Fishbowl Panel - now it’s your turn! We’ll be finishing up the event with a fishbowl session. You have a chance to join our experts on panel, to share your experiences, questions, and thoughts on the topic. This time we’re doing a cozy Stimmtisch with a special guest - Robert (Uhlich), portfolio manager at Companisto, the leading crowdinvestment companie in Germany, will give us insights into crowdinvestment, success stories and failures; and all while sitting in a bar over drinks. What should I expect from this meetup? This is an informal meetup for people interested in sustainability and using the web as a lever for effective environmental change - we’ll have a couple of tables reserved, for everyone to catch up, swap stories and maybe meet someone else to work with on future projects. Do I have to be an expert in sustainability, or a programmer? Boy is it hot out! It seems a shame to miss out on the gorgeous weather, so instead of cooping ourselves up indoors, we’re meeting at Birgit and Beer. This is informal meetup for people interested in sustainability and using the web as a lever to effect environmental change - we’ll have a couple of tables reserved, for everyone to catch up, swap stories and maybe meet someone else to work with on future projects. This time we do a Stammtisch to openly discuss climate change, start-ups, technology, sustainability, environmental psychology and all kinds of cleanwebby topics. We meet at a nice Biergarten close to Schlesisches Tor in the center of Berlin. What should expect from this meetup? Experts, open discussions, inspiring people and drinks. Cleanweb is about how we can use the web and connecting technologies to save the planet. On the day before Ecosummit, THE cleantech event in Europe, we’re showcasing some of Europes’s finest cleanweb startups. After last year’s success, we’ll be hearing this year’s batch of startups from Rockstart’s Smart Energy Accelerator in Amsterdam. you, the audience have a minute to reflect, and jot down your feedback for them. All nine startups from Rockstart’s current batch of smart energy startups will pitch at the event. Swuto is a next generation price comparison platform. Swuto automatically compares and switches your energy supplier so you are always on the cheapest energy tariff. Zenodys platform is the easiest way to build and automate the Internet of Things (IoT). Just connect, drag and drop and innovate new IoT products, services and prototypes. Our mission is to make the automation of the world around us ridiculously simple. And to push the limits of human innovation to the completely new level. Bleeve is a social internet platform that connects people on the topic of saving and producing energy at home. We help home owners to stop paying money for energy they don’t need. Users get tips on how to use less energy, and they’re able to connect with others to undertake joint initiatives such as the purchasing of solar panels. We partner with (local) suppliers to close the loop. Capacity Energy Storage is an energy service provider around flexibility management. Our focus lies on providing solutions for unbalance issues, frequency control and congestion management. Our company has a background in smart storage and has capabilities in both delivering services as well as hardware (batteries and flywheels). Additionally, CES is looking to develop storage and aggregation solutions for households to allow them to benefit from dynamic market prices for power, as well as optimization of own use of self generated power, if and when market conditions allow. VIRIDOM serves as the bridge between the electricity user and the power utility. More specifically, VIRIDOM puts electricity users in real-time control of their consumption, production and storage, while at the same time it facilitates true automated demand-side management and fuels customer engagement for the utility companies. In this way, VIRIDOM provides the basis over which utilities could rebuild trust with their consumers. Wirewatt is a B2B online marketplace that connects residential solar projects in emerging economies with the capital markets. Wirewatt makes solar distributors and installers sell more projects through software tools that help them design, quote and create automated technical and financial investor-­grade project proposals. Also, Wirewatt helps institutional investors set up funds, manage distributed solar assets and market it’s capital through its network of affiliated solar companies. Entelligo is a mobile app to assist the sales professionals of renewable energy systems in the residential market. Starting from few questions to the customer, Entelligo provides a fast and easy way to generate an optimized commercial proposal, ready to be signed. Expert talks, open discussions, inspiring people and drinks. Curious about giving a talk? Drop us a line and/or check our speaker’s page here. This time round, its the first part of our smart cities series of events. We will kick this off by looking at how energy production and consumption in a ‘smart city’ can look like. So, why should you get energy from a power plant kilometers away, when your neighbour generates more energy with his roof-top solar, CHP or heat pump than he can use? We’re lucky enough to have environmental economist Christian Huder speaking about his work on micro grids. Short, fun talks about tech and sustainability. 3-5 mins each. After the talks, we’ll be opening the conversation to the room, with a fishbowl discussion. A fishbowl is like a panel discussion, but open for anyone in the audience to join the stage, to make the most of the knowledge in the room. We will go to a nearby bar afterwards. Looking forward to meet you in person! P.S. : Like us on facebook or share our facebook event. As temperatures plunge around Berlin, we have two speakers talking about how they’re using the web to help Germany stay cozy without cooking the planet. CO2online is a non-profit organization campaigning for climate protection, and in 2014 it ran half a million people online energy consulting sessions to help consumers on how to save energy and reduce CO2 emissions. 7:30 2nd Speaker - Disrupting the heating industry? What does a Berlin startup have to do with German private household heating, master craftsmen and the energy transition? What to expect from this meetup? We’re trying out a social meetup this month, while we all recover from the new year, before starting our meetups in earnest in January. Come to Kaschk to meet some like-minded people with an interest in sustainability, mobility, cleanweb, energy, tech (or all of the above) and chat, catch up, network and work out what do with 2015. We’ll have a couple of tables reserved for Berlin - come by for a drink or stay the whole evening! This time round, we’re looking at how you can apply psychology to service and web design, to make it easier for user to Do The Right Thing. Big thanks for Climate KIC for the drinks, food and space! We’re lucky enough to have environmental psychologist Christian Hoffman speaking about his work on service design and environmental sustainability. Daniela is co-founder and COO of Changers.com. She has a background in media arts and is deeply involved into encouraging women to go into tech. Co-founder of ecotastic, Anna Yukiko Bickenbach believes in real behavior change with spice :D, pushing the environmental movement one step at a time and taking risks for humanity with dignity. We’re looking for speakers, and have one more slot going! Curious about giving a talk? Check our speaker’s page here. After the talks, we’ll be opening the conversation to the room, with a fishbowl discussion. Fishbowl is like a panel discussion, but open for anyone in the audience to join the stage, to make the most of the knowledge in the room. It worked great last time, so we’re giving it another go! Our friends at Hack4good are running a cleanwebby Hackday on the weekend of Sept 12th, and we’re working together to host a pre-event social at the Baumhaus. Come along, and chat with other environmentally-minded designers, makers, developers and people with a shared interest in the web, and in sustainability. Working on an event or project and looking for help? Or wanting to make that elusive hire? Here’s your chance. This month we’ll be talking about what options are available to early stage projects, beyond hackathons. How do you keep momentum after an event, and what support is out there to help you? Curious? Come along and join the discussion. If you’re thinking of going to hack4good, or mentoring there, this is a good place to meet others in person, and some of the organising team, to get an idea of how the weekend will go. If you’re just interested in meeting other-like minded people, thinking of giving a talk at a future cleanweb event, come along and help build a community of using the web to make the world a better place. Join us at the Green Garage Incubator to enjoy two talks, a few drinks, and food. Collaborative efforts are thriving everywhere, but still lack visibility. Where cartographic visualizations exist, they are limited in scope, scattered and under-used. This process aims at collecting, linking and visualizing existing groups, projects and initiatives of the collaborative economy. How do you compare spending on fossil fuels subsidies to renewables if you can’t follow the funding? How can you see who benefits from poor environmental standards when you can’t track how they’re made. See how OpenOil is using open data and crowd sourcing to make this visible for the first time, See how OpenOil is using open data and crowd sourcing to make this visible for the first time, and how iilab is building the technology for it. Interested in speaking? Get in touch! This community event is supported by Climate-KIC who provide the venue, food & drinks for free. Thanks! If you’re tweeting tonight, use the #cleanweb tag to keep conversations connected! On the day before Ecosummit, THE cleantech event in Europe, we’re showcasing some of Europes’s finest cleanweb startups. We’ll be hearing from Rockstart’s Smart Energy Accelerator in Amsterdam, as well as a few home grown Berlin startups, whilst sampling some of Berlins’ finest beers. The venue can be pretty hard to find if this is your first time. 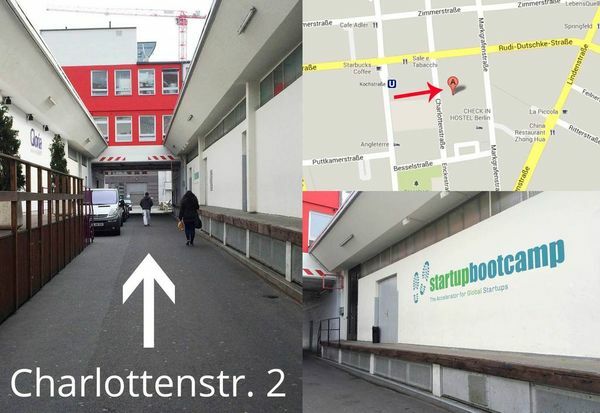 This map should help you make your way to the meetup, if you’re not familar with the Rainmaking Loft. Smart metering meets gamification to teach kids how to save energy and help reduce the household’s energy bill in a fun way. Dreamups brings the GitHub collaboration power to hardware engineers and designers, worldwide. They have developed a unique technology for hardware documentation and rapid crowd prototyping that changes how we can work and invent new exciting tech. Simply put, we believe that the most important asset of a company is its employees as they are the ones that keep it up and running. If they are unhappy, unhealthy or uncommitted, the company loses competitive advantage. That’s why we created GiveO2, a web & mobile platform that helps HR/CSR managers improve their company’s work environment while reducing absenteeism’s cost, through sustainability, ﬁtness & fun. PowerTags has developed and proven a technology that is high-performance, low-cost, and easily wearable, providing a uniquely effective solution that overcomes the performance limitations and high cost of current solutions. The solution is a combination of hardware (a bracelet and sensors) and cloud-based software that together can send an immediate alert in the event of a fall, as well as identify longer-term mobility-related trends in order to recommend medical attention. This solution offers peace of mind to family members, and enables timely medical intervention when necessary. QwikSense enables organisations to create healthy, productive and energy efficient work environments by generating actionable sensor data and analytics. Companies lose a huge amount of money on a yearly basis due to poor work environments. The quality of work environments directly affects employee health and productivity: the better the working environment, the lower the frequency of employee absence and the higher the productivity rate. Pedl makes cycling even more rewarding to support riding habits and to build routines for everyday cycling. The smartphone app which is available both for iPhone and Android, automatically records your riding activities to reward every mile with beautiful products from our partners. Tracking everyday rides will also support improving local riding conditions as researchers and decision makers get anonymous aggregated data. More at @gopedl. This month, we’re trying to get as good an overview of what’s happening in Cleanweb in Berlin. As such, we’re doing a round of lightning talks which will give us good insight into how diverse the Cleanweb community really is. If you want to do a talk and present your project or company, just ping us. Cleanweb Berlin - Intro Meetup! We’re bringing Cleanweb to Berlin, and want to start with a nice little get-together to see what happens in Berlin in the first place and what you are interested in. 7:25 - What is cleanweb? Chris Adams from Cleanweb London give an overview of what the term refers to, what the cleanweb community is doing around the world.